Kenya's president has declared the drought, which has affected as much as half the country, a national disaster. Uhuru Kenyatta appealed for international aid and said the government would increase food handouts to the most needy communities. Kenya's Red Cross says 2.7 million people face starvation if more help is not provided. Other countries in the region have also been hit by the drought, blamed on last year's El Nino weather phenomenon. In Somalia, nearly half the population, over 5 million, is suffering from food shortages and the UN says there is a risk of famine in several parts of the country. 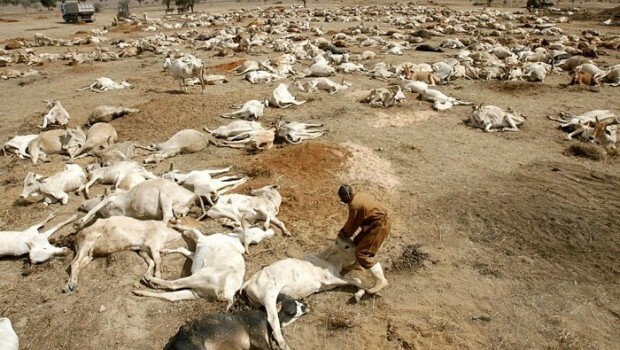 During the last drought on this scale in 2011, famine killed about 250,000 Somalis. In a statement, Mr Kenyatta said the government had allocated $105m to tackle the drought which has affected people, livestock and wildlife in 23 of Kenya's 47 counties. "Support from our partners would complement government's efforts in mitigating the effects of drought," he said. Mr Kenyatta added that all purchases of food and other items would be made in a transparent way. "I will not tolerate anybody who would try to take advantage of this situation to defraud public funds," the president said. An El Nino weather pattern, which ended in May, triggered drought conditions across the southern and eastern African region that hit the staple, maize, and other crops and dented economic growth. More than 1 million people in drought-hit southern Madagascar are experiencing "alarming" levels of hunger, and more aid is needed to prevent a dire situation from becoming a "catastrophe", UN agencies said on Thursday. Meanwhile as South Africa contends with a severe drought, officials at Kruger National Park have put a plan into action that they say will help avert mass die-offs of wildlife-through the selective culling of some of the park's largest grazers. This week, rangers began killing around 350 of the park's 7,500 hippos and 47,000 buffalo. The populations of both species are at their highest ever, according to officials. Reducing their numbers will not put either species at risk, rangers say, but will reduce some of the strain on the park's grasslands and water holes. Zimbabwe is one of many countries feeling the strain of El Nino, which has dried up rainfall across southern Africa over the last year, killing crops, disrupting hydropower production and forcing local water authorities to enforce stringent water rationing in some areas. More than 5 million people are facing food and water shortages. Last year, the agriculture ministry’s livestock department estimated that the national cattle herd stood at 5,3 million animals, down from over 6 million in 2014. Eugenics,Geoengineering.They go hand and hand.If the globalist wanted rain in Ethiopia they could make it rain.This is all a part of the globalist plan for depopulation.It will only get worse my friends.Much much worse until the Lord returns. These are very religious countries in which the dominant belief is that it's up to God how many children they have with many women having 15 children. In Ehtiopia alone, since Bandaid raised 260 million to feed 40 million starving Ehtiopians in the 1970s, they have since grown to nearly 100 million. What we also know is that in order to lift people out of poverty, the only course of action going by the evidence is by reducing family size, delaying and spacing pregancies and that it's not until fertility rates drop below 3, that we see significant improvements in health/nutrition, economic function, housing etc and more broadly improved living standards. But it doesn't end there. 1.8 billion births are projected by UNICEF in Africa by 2039. As for depopulating the planet, that's inevitable and we may even see the extinction of humans - not entirely unfair given we've wiped out more than 50% of known species in the last 40 years. Overpopulation is the most extreme tyranny imaginable, second only to those who insist on denial of overpopulation while at the same time denying women access to family planning and safe abortion. it's quite Ironic as a good study finds that Many African Nations have been doubling there population every 22 years. And this is after diseases like Aids, Ebola, Starvation and warfare. And Migration. It seems that even mother nature wants to slow down the baby factories that produce children that they can't even feed. If there is so much famine and malnutrition in Africa, how do they manage so many offspring that have to be fed and housed? American and European couples both working, forgo parenthood or maybe have one child because of the expense. Your spot on! This is exactly what is occurring. well there is geo engineering that causes droughts and yes poor people tend to not practice birth control and have kids hoping that at least one will care for them in their old age. IMO charities need to help people grow food in dry climates with drip irrigation etc. All of your answers just speak to how much you don't understand the African culture, the day to day struggle most go through just to find a job to that will pay them $2 per week, the extreme lack of birth control available to women in Africa that would allow them to prevent future children they can't feed. And frankly your desire to install Western/European values, culture and thinking on others just speaks to either your ignorance of the need to respect others cultures or your own over inflated view that only European/Western culture is right and the rest of the world should conform. What a sad, boring world that would be. A form of child abuse and stupidity, breeding more than you can take care of in the 21st century. Africans lack critical thinking abilities (genetics perhaps?). Long ago, large families, helped on farms did many chores; now machines do most work. Now people want handouts from other countries. To all of you: It's the drought, stupid. Maybe you should get a real education - not one from listening intellectual idiot giving a lecture from the cd player of your $30-$50k car !! Every goddamned one of you could have lived for less if you wanted a child. You only waited, delayed or prevented pregnancies so you could afford that car, the more expensive house or whatever. These people have a right to their own spirituality and you don't like it and think there is overpopulation, then go kill yourself, your brother, your sister or YOUR KIDS, you worthless genocidal maniacs. There are partial truths in all of these blogs. Obviously the people of Africa are suffering and need to respond in order to limit more suffering. Hopefully the people & organizations that have best intentions & competency will be effective in helping to deal with lack of sustainable farming, family planning, and economic stabilization; all are interlinked. Climate change is happening and impacting some nations more than others. Geoengineeing is part of the problem since hydrological cycles are disrupted worldwide. Is this covertly overt weather manipulation targeting & impacting whole nation's? Well I don't know but we do know they have the capacity & capability to do as they please. So far no one has been able to stop chemtrailing and it seems to get more amped up around the globe every year. We are all impacted & should unite with the goal of having these toxic operations stopped and revealed. The tremendous wildfires that hit the western US & Chile are a prime example of how badly geoengineering is able to impact climate. When will we stand up against the global elites who do as they please and are responsible for the majority of human division & sufferng? Come explore ways we can educate against world hunger with proven tools and process you never knew existed.